Snack-time seems to be where so many people fall down when it comes to clean and nutritious eating. All good intentions of consuming whole foods on a regular basis, go out the window as boredom may set in OR you are ill-prepared for the moment. So with those 2 factors taken into consideration and the fact that 2014 is a clean slate… how about you try something new? 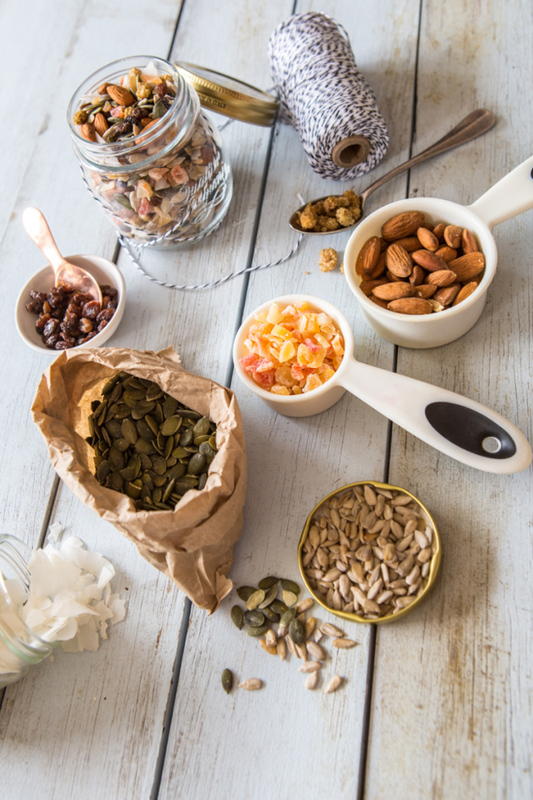 When you need a snack, you may have heard before that nuts and seeds contain good fats and protein that keep us fuller for longer. As delicious as they are, when combined with a few sweet treats AKA dried fruit, they result is heavenly! It feels like you are indulging, and in some ways you are. 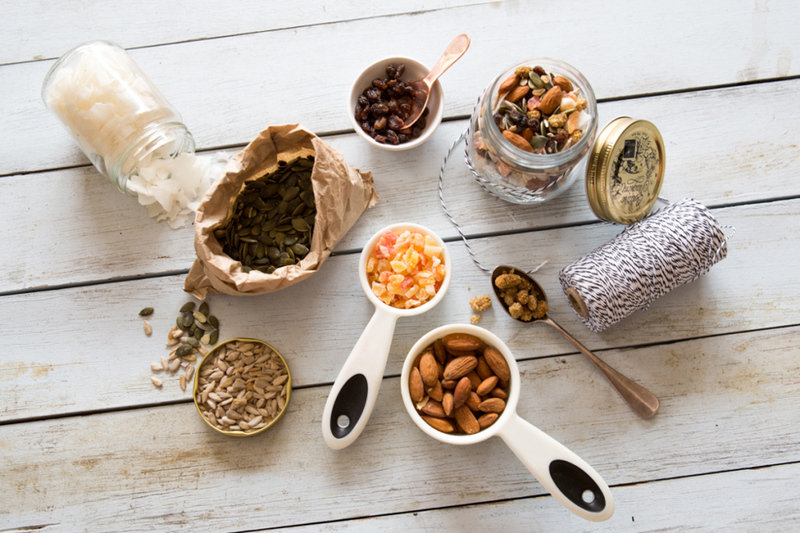 Trail mix is full of high-calorie and nutrient-dense ingredients so is best enjoyed in moderation. This is no different to other snacks, in that when I enjoy a boiled egg or 2 as a snack, I don’t consume 6 at a time; same theory here. What I also love is that you spend a small amount of time prepping and can make a huge batch of the stuff, it makes a wonderful and thoughtful gift + it is a great addition to your kids’ lunchbox! This is not complicated, or only for “health experts,” you can replicate this yourself easily and enjoy it as a delicious and nourishing snack. Should you come across an ingredient that you don’t like, haven’t heard of, can not find – fear not! Firstly, I would ask that you keep an open-mind and try them out (I promise this combo is delish), though you can absolutely use this recipe as a base and allow your imagination to change things up a bit as you wish. Buying the ingredients in bulk (I buy from a bulk whole foods store) and making in bulk will save you both time and money. If you still consider this to be an expensive snack, think about how much that banana bread, muffin or muesli bar costs you each time…?? I would recommend to have a few jars going for say home and work, this way you don't need to transport food around all the time, it's already there and you're less likely to reach for the sugary not-so-helpful foods. A few dollars will buy you a cute vintage jar and you could fill this with your trail mix, tie some cute twine around it and label it with love for someone in your life. I promise they will love it! Appetite guilt Motivation – where does it come from? 2 Responses to "Trial some Trail Mix"